If a house was built before 1990, this hazardous material is potentially hiding somewhere behind its walls, and it could put workers and family members at risk of serious health problems. Home renovations can be exciting and all-consuming, not to mention stressful. While it’s easy to get wrapped up in the finer details—such as selecting colour schemes and lighting solutions—many homeowners overlook a hidden hurdle: addressing asbestos. In a recent province-wide survey, WorkSafeBC found that only half of the homeowners in British Columbia who responded think it’s their responsibility to test for asbestos before a renovation or demolition. Furthermore, only about a third (36%) of homeowners who had done a reno of a pre-1990’s home in the last five years recalled testing for asbestos prior to work starting. WorkSafeBC is enhancing the work it already does with workers and employers in BC around the dangers of asbestos exposure with a campaign to make homeowners aware of the role they play in keeping everyone safe on their project. The campaign is about asbestos awareness, testing, and safe removal – before starting work on renos or demos. Knocking down drywall, ripping up vinyl tiles, and removing insulation, for example, can release colourless and odourless asbestos into the air. When asbestos is inhaled, it can damage a person’s lungs and lead to diseases such as lung cancer, mesothelioma (an aggressive cancer that develops in the lining of the chest or abdomen) and asbestosis (scarring of the lung tissue that leads to shortness of breath). 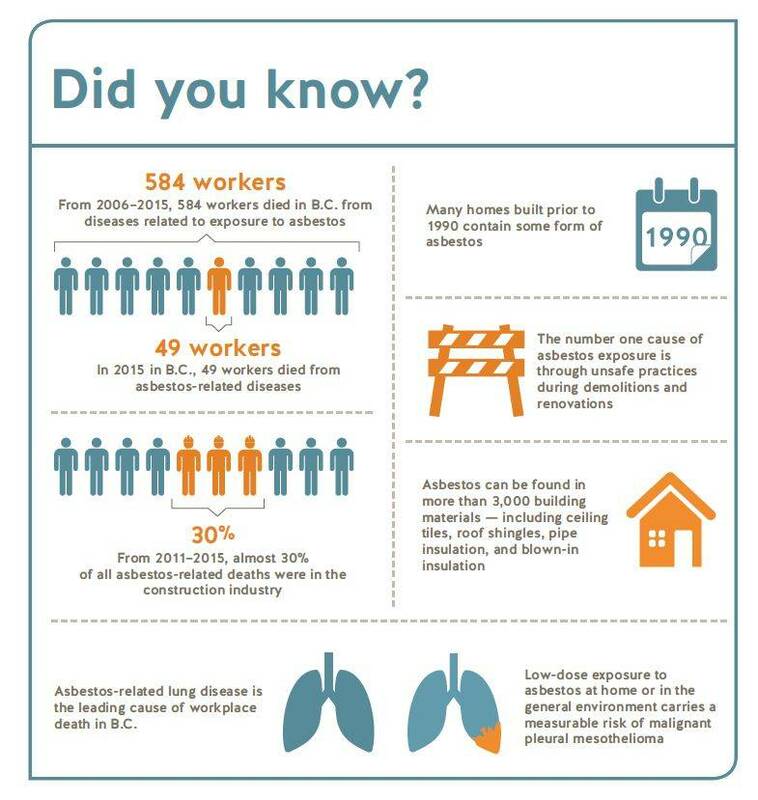 In fact, asbestos-related lung disease is the leading cause of workplace death in B.C., claiming 49 lives last year alone. “The more homeowners think about asbestos, and the more they know about how to identify it and have it properly removed from their homes, the better equipped they’ll be to prevent potential exposures,” says Johnson. That’s important because exposure to asbestos can pose serious health risks, not only to those working in the home, but also to family members in the home. When Glenny recently had her flooring replaced, asbestos was top of mind. She conferred with the contractor and together they decided to leave the old linoleum in place and put the new flooring on top. If you suspect asbestos is in your home, it’s important to hire a qualified testing company that will take samples of materials and send them to a lab before any reno work is completed. In the event asbestos-containing materials have been identified, the next step is to have the material removed by a qualified asbestos abatement contractor. Qualified companies can be found through the Hazardous Materials Association of BC or the BC Association of Restoration Contractors.